SAP direct activity allocation is used in the cost center accounting sub module of SAP CO which involves recording, measuring and allocation of the performed services. Now, to do so the user must maintain the cost drivers or the measurable tracing factors which are known as activity typesin cost center accounting. In other words, posting and recording is performed based on the activity types. This method directly charges the cost center providing activity or process to the receiver. The posting contains all the information such as the sender cost center name, cost driver name, quantity used or consumed by the receiver cost center (or order) along with the receiver information. Direct internal activity allocation in SAP is the process of documenting the activities of sender cost centers to the receiving cost centers based on the activity type. It is a transaction-based posting on a real-time basis within controlling module and it enables you to have an updated cost information in the cost centers at any given point of time. Later, we will perform SAP direct activity allocation to transfer the cost from the “Electricians” cost center to the “ADMIN” cost center. The cost center “ADMIN” will be debited and the cost center “Electricians” will be credited simultaneously. 2000 x $15 = $30000. Later, we will perform SAP direct activity allocation to transfer the cost from the “Purchasing dept.” process to the “Purchasing” cost center. The cost center “Purchasing” will be debited and the process “Purchasing dept.” will be credited. If the receiving end of the activity allocation is not a cost object (e.g., business process, internal order or cost center) and the prices are not maintained manually, then the planned price is taken under consideration. If the receiving end of the activity allocation is a cost object (e.g., business process, cost center or internal order), then the prices from the valuation variant are considered which is in turn linked to the cost center from the costing variant. 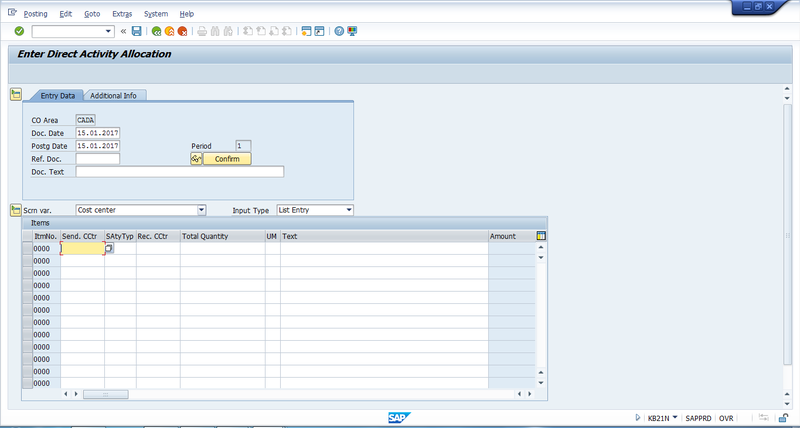 How to Post SAP Direct Activity Allocation? Alternatively, you can directly start the transaction KB21N from the command field. Confirm the postings of allocation in the receiver and sender cost centers using the line items report in the transaction KSB1.